You always hear that Krakow is the the jewel of Poland, but don't skip Warsaw! It's the capital of Poland and definitely worth visiting. Probably not the most popular way to arrive, but I have to say, it was easier navigating in this big city than I thought it might be. We are pretty experienced at driving and navigating in foreign places, but in big cities you just never know how it will go. ...And we arrived late on a weekday afternoon with traffic. The city is on the Vistula River, but the river doesn't dominate the sights of the city as rivers do in some places. Warsaw is sometimes known as the "Phoenix city" as it was almost completely destroyed in WWII, and it has been rebuilt with great effort. This may be reason enough to visit. The Old Town looks as though it has been there forever, but it is mostly new. Quite an achievement we thought. The Royal Castle was nothing but a pile of bricks up until 1971. The rebuilding efforts continued through 1988. It looked pretty much as it must have through the centuries. Today the castle appears to serve as a central point of life in Warsaw. Castle Square, Plac Zamkowy, is the irregularly shaped square that the castle sits on. Tourists and locals sit on the steps of the Sigismund's Column (or Zygmunt's Column -- in Polish it's Kolumna Zygmunta). Outdoor cafes are scattered around the square where you can join other tourists and locals relaxing and enjoying the ambience. 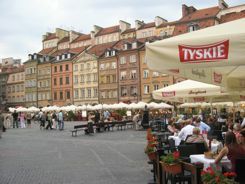 Most with outdoor seating areas grouped around the mermaid statue in the middle of this old market square. Old Town sits within the old city walls. This area was also meticulously rebuilt using pre-war architectural drawings... even using as many of the original bricks and salvageable decorative features as possible. They did such a fine job that Warsaw's Old Town is a UNESCO World Heritage Site. Poland claims the astronomer Copernicus as a native son. A statue of him anchors the pretty street called the Krakowskie Przedmiescie, that runs from Market Square to Castle Square. There are lots of churches to visit, and most are strung along this street. The Church of the Holy Cross has an urn which contains the heart of the composer Frederick Chopin. The Church of the Visitation (also known as the Church of Saint Joseph) is one of the few churches that was not destroyed during the war, so the ornate interior is beautiful. Just outside the city walls and down the hill from the Old Town is the "New Town", Nowe Miasto. This new town dates from the 15th century. It's a nice area to wander in, but there is not as much to see here as in Old Town. One of it's biggest claims to fame is that Marie Curie was born here, and you can tour her house if you want to. Outside of the Old Town there is a mixture of architectural styles. We confined our visit to the Old Town and the palaces and gardens. Much of the rest of the city contains modern building and some from the cold war era that aren't too interesting to tourists. Concentrate on the Old Town, and you'll love a visit to Warsaw.